We may be sure that a season so sacred as this of Lent is rich in mysteries. The Church has made it a time of recollection and penance, in preparation for the greatest of all her feasts; she would, therefore, bring into it everything that could excite the faith of her children, and encourage them to go through the arduous work of atonement for their sins. During Septuagesima, we had the number , which reminds us of those seventy years of captivity in Babylon, after which God's chosen people, being purified from idolatry, was to return to Jerusalem and celebrate the Pasch. It is the number that the Church now brings before us: a number, as St. Jerome observes, which denotes punishment and affliction. Let us remember the forty days and forty nights of the deluge sent by God in His anger, when He repented that He had made man, and destroyed the whole human race with the exception of one family. Let us consider how the Hebrew people, in punishment for their ingratitude, wandered forty years in the desert, before they were permitted to enter the promised land. Let us listen to our God commanding the Prophet Ezechiel to lie forty days on his right side, as a figure of the siege which was to bring destruction on Jerusalem. There are two persons in the old Testament who represent the two manifestations of God: Moses, who typifies the Law; and Elias, who is the figure of the Prophets. Both of these are permitted to approach God: the first on Sinai, the second on Horeb; but both of them have to prepare for the great favor by an expiatory fast of forty days. With these mysterious facts before us, we can understand why it is that the Son of God, having become Man for our salvation and wishing to subject Himself to the pain of fasting, chose the number of forty days. 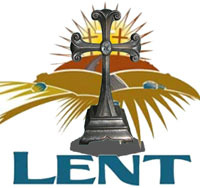 The institution of Lent is thus brought before us with everything that can impress the mind with its solemn character, and with its power of appeasing God and purifying our souls. Let us, therefore, look beyond the little world which surrounds us, and see how the whole Christian universe is, at this very time, offering this forty days' penance as a sacrifice of propitiation to the offended Majesty of God; and let us hope that, as in the case of the Ninevites, He will mercifully accept this year's offering of our atonement, and pardon us our sins. The number of our days of Lent is, then, a holy mystery: let us now learn, from the liturgy, in what light the Church views her children during these forty days. She considers them as an immense army, fighting day and night against their spiritual enemies. We remember how, on Ash Wednesday, she calls Lent a Christian warfare. In order that we may have that newness of life, which will make us worthy to sing once more our , we must conquer our three enemies: the devil, the flesh, and the world. We are fellow combatants with our Jesus, for He, too, submits to the triple temptation, suggested to Him by Satan in person. Therefore, we must have on our armor, and watch unceasingly. And whereas it is of the utmost importance that our hearts be spirited and brave, the Church gives us a war-song of heaven's own making, which can fire even cowards with hope of victory and confidence in God's help: it is the ninetieth Psalm. She inserts the whole of it in the Mass of the first Sunday of Lent, and every day introduces several of its verses into the ferial Office. She there tells us to rely on the protection, wherewith our heavenly Father covers us, as with a shield; to hope under the shelter of His wings; to have confidence in Him; for that He will deliver us from the snare of the hunter, who had robbed us of the holy liberty of the children of God; to rely upon the succour of the holy angels, who are our brothers, to whom our Lord hath given charge that they keep us in all our ways, and who, when Jesus permitted satan to tempt Him, were the adoring witnesses of His combat, and approached Him, after His victory, proffering to Him their service and homage. Let us well absorb these sentiments wherewith the Church would have us to be inspired; and, during our six weeks' campaign, let us often repeat this admirable canticle, which so fully describes what the soldiers of Christ should be and feel in this season of the great spiritual warfare. But the Church is not satisfied with thus animating us to the contest with our enemies: she would also have our minds engrossed with thoughts of deepest import; and for this end she puts before us three great subjects, which she will gradually enfold to us between this and the great Easter solemnity. Let us be all attention to these soul-stirring and instructive lessons. And firstly, there is the conspiracy of the Jews against our Redeemer. It will be brought before us in its whole history, from its first formation to its final consummation on the great Friday, when we shall behold the Son of God hanging on the wood of the cross. The infamous workings of the Synagogue will be brought before us so regularly, that we shall be able to follow the plot in all its details. We shall be inflamed with love for the august Victim, whose meekness, wisdom, and dignity bespeak a God. The divine drama, which began in the cave of Bethlehem, is to close on Calvary, we may assist at it, by meditating on the passages of the Gospel read to us by the Church during these days of Lent. The second of the subjects offered to us, for our instruction, requires that we should remember how the feast of Easter is to be the day of new birth for our catechumens, and how, in the early ages of the Church, Lent was the immediate and solemn preparation given to the candidates for Baptism. The holy liturgy of the present season retains much of the instruction she used to give to the catechumens; and as we listen to her magnificent lessons from both the old and the new Testament, whereby she completed their , we ought to think with gratitude of how we were not required to wait years before being made children of God, but were mercifully admitted to Baptism even in our infancy. We shall be led to pray for those new catechumens, who this very year, in far distant countries, are receiving instructions from their zealous missioners, and are looking forward, as did the postulants of the primitive Church, to that grand feast of our Saviour's victory over death, when they are to be cleansed in the waters of Baptism and receive from the contact a new being-regeneration. Thirdly, we must remember how, formerly, the public penitents, who had been separated on Ash Wednesday from the assembly of the faithful, were the object of the Church's maternal solicitude during the whole forty days of Lent, and were to be admitted to reconciliation on Maundy Thursday, if their repentance were such as to merit this public forgiveness. We shall have the admirable course of instructions, which were originally designed for these penitents, and which the liturgy, faithful as it ever is to such traditions, still retains for our sake. As we read these sublime passages of the Scripture, we shall naturally think upon our own sins, and on what easy terms they were pardoned us; whereas, had we lived in other times, we should have probably been put through the ordeal of a public and severe penance. This will excite us to fervour, for we shall remember that, whatever changes the indulgence of the Church may lead her to make in her discipline, the justice of our God is ever the same. We shall find in all this an additional motive for offering to His divine Majesty the sacrifice of a contrite heart and we shall go through our penances with that cheerful eagerness, which the conviction of our deserving much severer ones always brings with it. In order to keep up the character of mournfulness and austerity which is so well suited to Lent, the Church, for many centuries, admitted very few feasts into this portion of her year, inasmuch as there is always joy where there is even a spiritual feast. In the fourth century, we have the Council of Laodicea forbidding, in its fifty-first canon, the keeping of a feast or commemoration of any saint during Lent, excepting on the Saturdays or Sundays. The Greek Church rigidly maintained this point of lenten discipline; nor was it till many centuries after the Council of Laodicea that she made an exception for March 25, on which day she now keeps the feast of our Lady's Annunciation. The Church of Rome maintained this same discipline, at least in principle; but she admitted the feast of the Annunciation at a very early period, and somewhat later, the feast of the apostle St. Mathias, on February 24. During the last few centuries, she has admitted several other feasts into that portion of her general calendar which coincides with Lent; still, she observes a certain restriction, out of respect for the ancient practice. The reason why the Church of Rome is less severe on this point of excluding the saints' feasts during Lent, is that the Christians of the west have never looked upon the celebration of a feast as incompatible with fasting; the Greeks, on the contrary, believe that the two are irreconcilable, and as a consequence of this principle, never observe Saturday as a fasting-day, because they always keep it as a solemnity, though they make Holy Saturday an exception, and fast upon it. For the same reason, they do not fast upon the Annunciation. This strange idea gave rise, in or about the seventh century, to a custom which is peculiar to the Greek Church. It is called the , that is to say, consecrated in a previous Sacrifice. On each Sunday of Lent, the priest consecrates six Hosts, one of which he receives in that Mass; but the remaining five are reserved for a simple Communion, which is made on each of the five following days, without the holy Sacrifice being offered. The Latin Church practices this rite only once in the year, that is, on Good Friday, and this in commemoration of a sublime mystery, which we will explain in its proper place. This custom of the Greek Church was evidently suggested by the forty-ninth canon of the Council of Laodicea, which forbids the offering of bread for the Sacrifice during Lent, excepting on the Saturdays and Sundays. The Greeks, some centuries later on, concluded from this canon that the celebration of the holy Sacrifice was incompatible with fasting; and we learn from the controversy they had, in the ninth century, with the legate Humbert, that the (which has no other authority to rest on save a canon of the famous Council in , held in 692) was justified by the Greeks on this absurd plea, that the Communion of the Body and Blood of our Lord broke the lenten fast. The Greeks celebrate this rite in the evening, after Vespers, and the priest alone communicates, as is done now in the Roman liturgy on Good Friday. But for many centuries they have made an exception for the Annunciation; they interrupt the lenten fast on this feast, they celebrate Mass, and the faithful are allowed to receive holy Communion. The canon of the Council of Laodicea was probably never received in the western Church. If the suspension of the holy Sacrifice during Lent was ever practiced in Rome, it was only on the Thursdays; and even that custom was abandoned in the eighth century, as we learn from Anastasius the Librarian, who tells us that Pope St. Gregory II., desiring to complete the Roman sacramentary, added Masses for the Thursdays of the first five weeks of Lent. It is difficult to assign the reason of this interruption of the Mass on Thursdays in the Roman Church, or of the like custom observed by the Church of Milan on the Fridays of Lent. The explanations we have found in different authors are not satisfactory. As far as Milan is concerned, we are inclined to think that, not satisfied with the mere adoption of the Roman usage of not celebrating Mass on Good Friday, the Ambrosian Church extended the rite to all the Fridays of Lent. After thus briefly alluding to these details, we must close our present chapter by a few words on the holy rites which are now observed, during Lent, in our western Churches. We have explained several of these in our 'Septuagesima.' The suspension of the ; the purple vestments; the laying aside of the deacon's dalmatic, and the subdeacon's tunic; the omission of the two joyful canticles and ; the substitution of the mournful for the Alleluia-verse in the Mass; the instead of the ; the additional prayer said over the people after the Postcommunions on ferial days; the celebration of the Vesper Office before midday, excepting on the Sundays: all these are familiar to our readers. We have now only to mention, in addition, the genuflections prescribed for the conclusion of all the Hours of the Divine Office on ferias, and the rubric which bids the choir to kneel, on those same days, during the Canon of the Mass. It was the custom also, in many churches, to veil the crucifix and the statues of the saints as soon as Lent began; in order to excite the faithful to a livelier sense of penance, they were deprived of the consolation which the sight of these holy images always brings to the soul. But this custom, which is still retained in some places, was less general than the more expressive one used in the Roman Church, which we will explain in our next volume-the veiling of the crucifix and statues only in Passiontide. We learn from the ceremonials of the middle ages that, during Lent, and particularly on the Wednesdays and Fridays, processions used frequently to be made from one church to another. In monasteries, these processions were made in the cloister, and barefooted. This custom was suggested by the practice of Rome, where there is a for every day of Lent which, for many centuries, began by a procession to the stational church. Lastly, the Church has always been in the habit of adding to her prayers during the season of Lent. Her discipline was, until recently, that, on ferias, in cathedral and collegiate churches which were not exempted by a custom to the contrary, the following additions were made to the canonical Hours: on Monday, the Office of the Dead; on Wednesday, the Gradual Psalms; and on Friday, the Penitential Psalms. In some churches, during the middle ages, the whole Psalter was added each week of Lent to the usual Office. 6 3 Kings xix. 8. 7 Ps. , in the Office of Compline. 15 Can. 52. Labbe, tom. vi. 17 See their explanation in the volume for Septuagesima. 18 Honorius of Autun. lib. iii. cap. lxvi. 19 Martene. tom. iii. cap. xviii.